Don’t call me crazy but I cooked steak in the Instant Pot. I saw a post on Facebook. This lady said that she cooked steaks in her IP all the time. I couldn’t stop thinking about it. I know that the grill is probably a better choice to prepare steak. But let’s be honest my grill is covered in an inch of dust and birds actually built a nest in there last year. Surprise surprise I don’t use my grill very often (I’m too busy using my slow cooker and instant pot). So if you’re in an adventurous mood and want to make some delicious steak gyros I’ll show you how! First you’ll need to pick out some thick steaks–about an inch and a half. 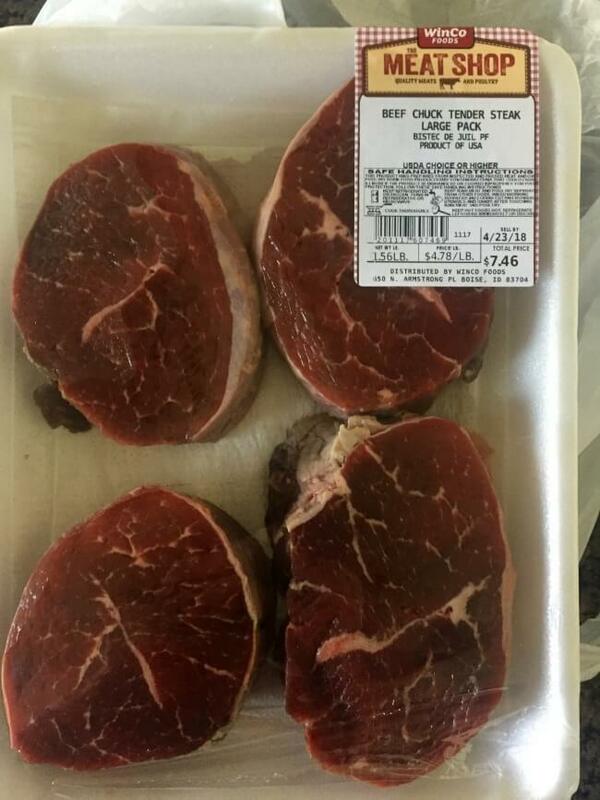 I bought a pound and a half of chuck tender steaks. I seasoned the steaks on both sides with lemon pepper seasoning. I used my fingers to rub the seasoning into the steak. Then I added some broth, onions and seasonings into the Instant Pot. I placed my trivet on top and gently set the steaks on top of the trivet. I had to sort of arrange them so that they wouldn’t overlap. I was able to fit all four steaks on my trivet. Then I set the pressure cook time to 4 minutes and crossed my fingers for the best. While the Instant Pot was heating up I turned on the broiler of my oven so I could “sear” them after they were done cooking in the IP. I also prepared a fantastic tzatziki sauce (yogurt cucumber sauce) with the yogurt I had made earlier that week in the IP. 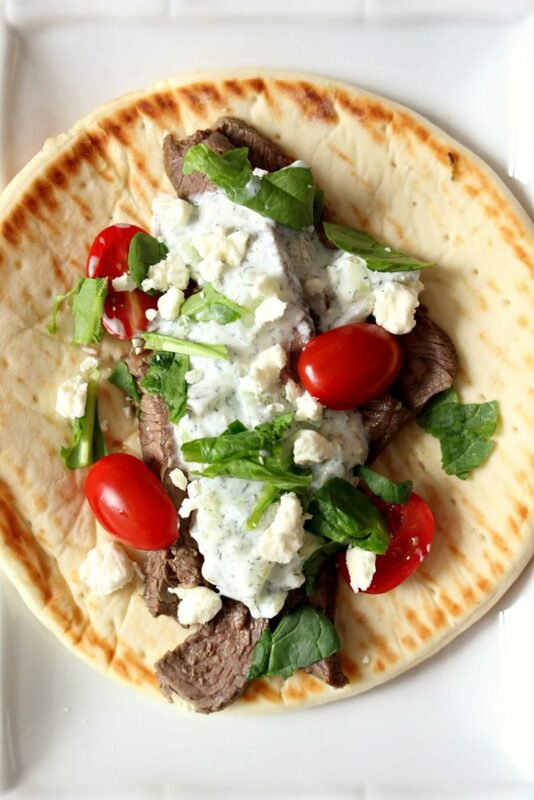 You MUST make the tzatziki sauce for these steak gyros. It is so easy to make and it just ties everything together in a pretty bow. After the steaks were done cooking I put them on a baking sheet and popped them under the broiler for 1 minute on each side. I stuck my instant read thermometer* (one of my favorite purchases ever) into the meat to make sure it was at the right temp. My steaks were at about 140 degrees F which is considered medium. If you want them a little more pink in the middle I would consider only cooking for 3 minutes in the IP instead of 4. I loosely covered them with foil and let them sit for 5 minutes. If you cut into them right away they won’t be nearly as juicy. Finally I sliced up the meat and piled it onto a warm pita with some of the tzatziki sauce and took a big bite. YUM! 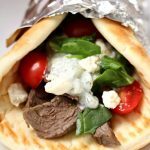 I loved these instant pot steak gyros so much! This is a perfect meal to make for this spring/summer. If you’re feeling up to the challenge make instant pot steak gyros this week! 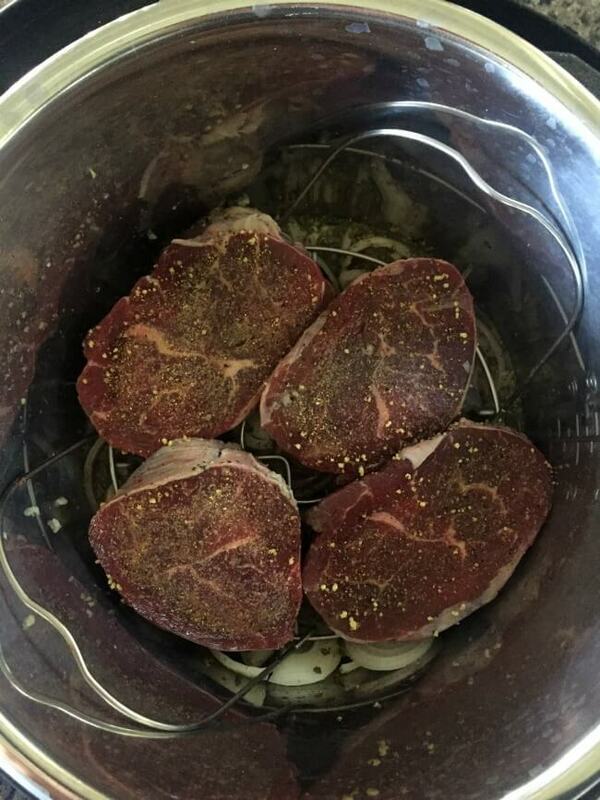 To make Instant Pot steak gyros I used my 6 quart Instant Pot Duo 60 7 in 1*. I love this Instant Pot because it has the yogurt making function which I use almost weekly. It has two pressure settings (high and low), and there are also little slots in the handles so that you can rest the lid there instead of putting it down on your counter-top. 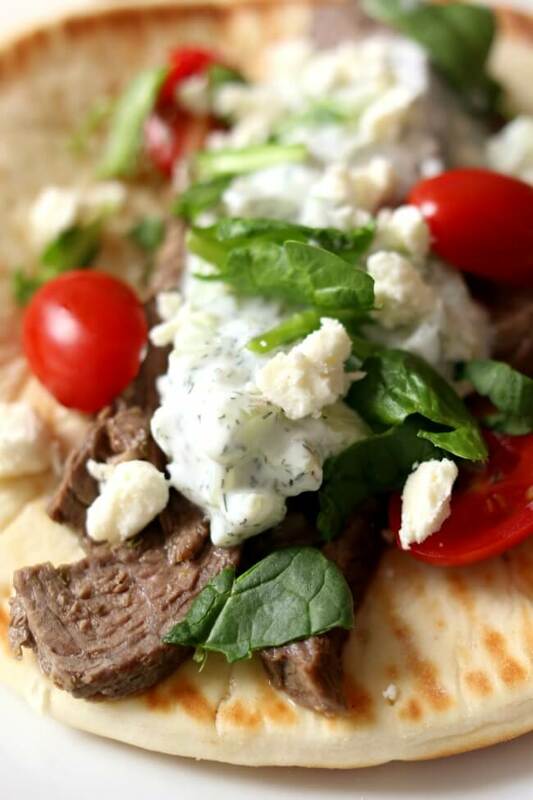 Tender, seasoned pieces of steak rolled up in a soft pita with tzatziki sauce, tomatoes, onions, lettuce and feta cheese. An easy meal that tastes amazing any night of the week! Pour broth, lemon juice and red wine vinegar into the Instant Pot. Add in the garlic, onion, oregano and allspice. Stir. Place the trivet* on top of the onion/broth mixture. Season each of the steaks with 3/4 tsp of lemon pepper seasoning on each side of the steak. I used my fingers to rub the seasoning into the meat. Place the steaks on the trivet and arrange them so they don’t overlap. Secure the lid in place and make sure the valve is set to “sealing.” For steaks more on the rare side set the timer to 3 minutes. For steaks on the medium side set the timer to 4 minutes. 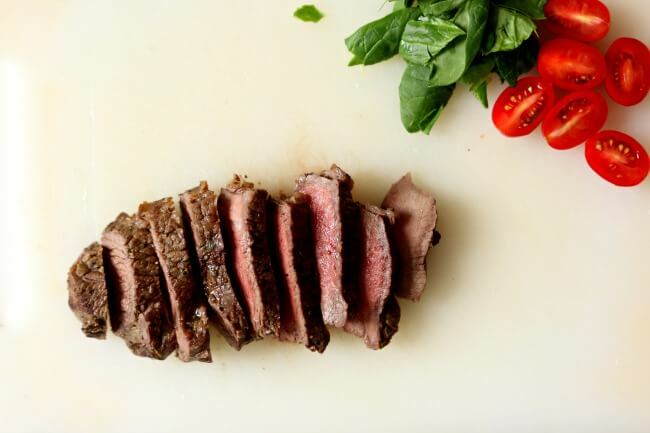 While the steak is cooking turn on your oven’s broiler (and you can also prepare your tzatziki sauce). When the timer is up move the valve to venting. Open the lid and place the steaks on a baking sheet. Turn OFF the Instant Pot and move the inner pot to the counter so the onion mixture can cool down. Place the steaks in the oven under the broiler for 1 minute. Turn them over and broil on the other side for a minute. Use a thermometer to make sure they are done (medium rare is 130 to 135 degrees F and medium is 140 to 145 degrees F). Loosely cover the steaks with foil and let them rest for 5 minutes. Once they have rested slice the meat and stir it in with the onion mixture. If the onion mixture is too hot it will cook your steaks so make sure it is cooled down. Prepare your tzatziki sauce by stirring the yogurt, cucumber, dill, salt and garlic together in a bowl. Salt and pepper to taste. 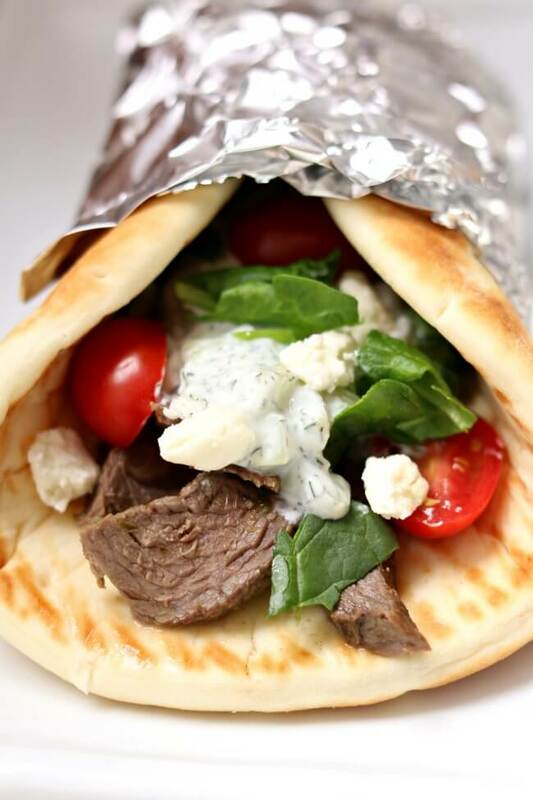 Use a slotted spoon to spoon the steak and some of the onions into the middle of a pita, top with tzatziki sauce, tomatoes, feta cheese and lettuce. Roll up and enjoy! Like this recipe for Instant Pot steak gyros? Get all my new recipes delivered to your email inbox by signing up below. Love your recipes, and thank you for sharing. Trying to load them to Paprika but just get the first page, not the ingredients or directions. Am I doing something wrong? would love to be able to save them in one place. I am not familiar with paprika. Is it an app? Yes, it is a recipe app. I am hoping to figure out why I can’t get them to load. Hmmm. that is really strange. I’ll have to look into it. I made this the other night using some stir fry beef I had in the freezer. turned out great! I made Soft Bread Wraps, a yeast bread recipe I got from King Arthur Flours. It’s really easy to make and a good substitute for Pita Bread. Definitely a keeper! Sounds great…can’t wait to try it! Do you think a steak Diane could be made in the IP? Probably! I’ll have to figure it out.